I’ve been building a robot with my boy for quite some time. It doesn’t move, but it does have awesome eyes! The eyes glow from inside the robot. 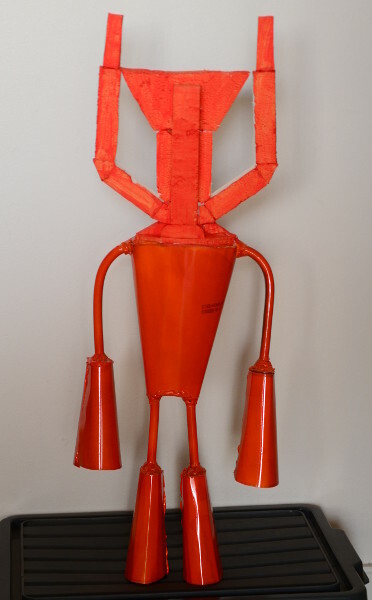 The robot is built from sheet metal rescued from old vegetable oil tins, with copper cable for arms and legs and a polystyrene foam head. The eyes were made hollow, with paper glued on behind, an RGB LED behind each eye, and then a layer of alfoil to guide all of the light out through the eyes. I’ve used an Arduino Uno to drive the LEDs. However, the arduino is programmed in C rather than Arduino language. I gave up on the Arduino environment when gnoduino disappeared from the archlinux repo, and I discovered that it’s not really much harder to code it in C. (It also avoids the hassles of programming around the limitations of the Arduino language.) You also get to do exactly what you want. There are three inputs, one for each colour. Each input should be connected to a momentary pushbutton connected to ground — such as a pair of wires floating around, in true Maker style. Activating an input fades one of the colours smoothly in or out. It looks pretty cool. * share under the same terms. // Tells us if a colour is to be brightened or darkened. // Get the current "time". // Determine elapsed time. Acounts for a single overflow.